At the Ambani-Piramal wedding, Sonam was seen in a custom Anamika Khanna lehenga with Amrapali emerald and diamond earrings. 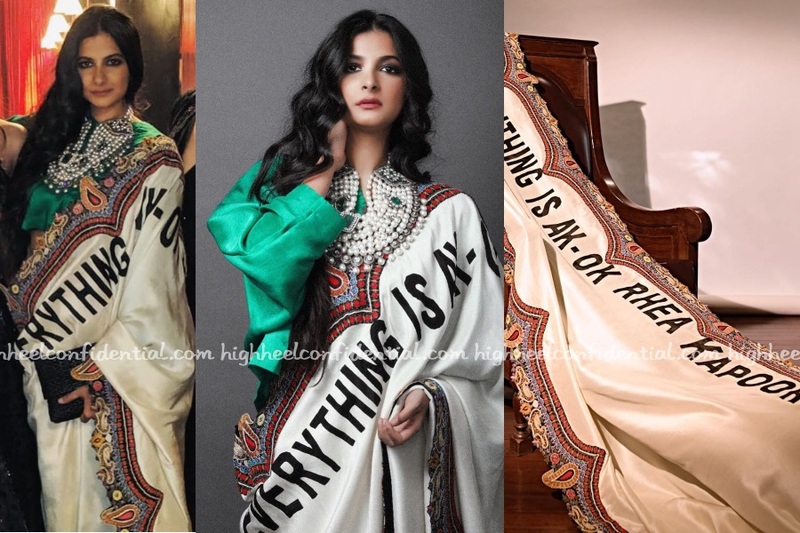 Also wearing custom Anamika featuring the “Everthing is AK-OK” + name verbiage was sister Rhea a few weeks ago to the Padukone-Singh wedding reception. I don’t mind the statement lettering. I actually loved Rhea’s outfit. But, the addition of the names was where all love was lost. If it was a subtle note in small lettering from the designer to the girls, I’d understand. As is though, it just looked garish. The entire charm of the whole celebrity is lost when the celebrity them-self is wearing a giant lettering of their own name. It just seems a bit self-centered. But, then I guess that is the name of the game. While the majority of men who attended the reception stuck to a formal suit, we had a few others who went the desi route and instantly stood out. 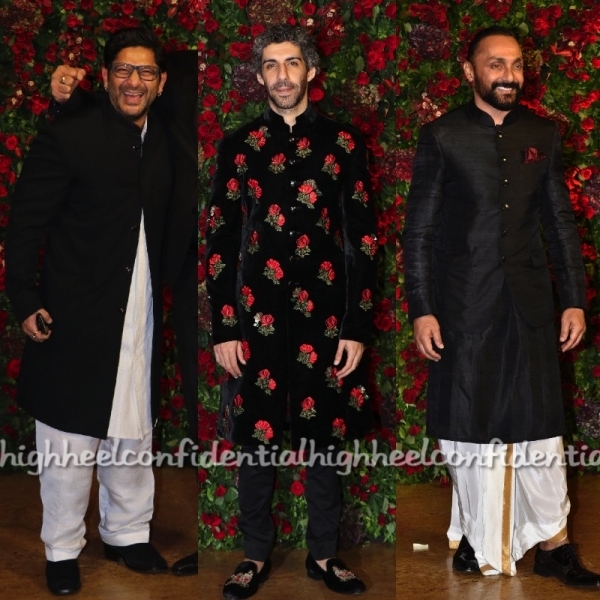 Jim Sarbh in Rohit Bal and Rahul Bose’s looks were both winners. Black suits and bow-ties or ties seemed to be the official outfit for men at Deepika Ranveer’s reception. Here is a round up of some other men who also dressed identically at the party. Question is; whose look are you digging the most in this lineup? At Deepika and Ranveer’s reception, Farhan looked rather dapper in his tux. He was accompanied by Shibani, who for the occasion picked a sheer Gavin Miguel dress to wear. A wispy updo, glossy pink lip and ankle-strap sandals rounded out her look. At a recent star-studded reception, Kubra was photographed in a Shantanu and Nikhil gown. Balancing the volume (of her gown), she rounded out the look with a sleek updo and a solitary cuff. She wore her look well.